CMCP-1100S Side-Exit, General Purpose Industrial Accelerometer Reliability Direct, Inc. Your Direct Source for Reliability, Maintenance, Test & Measurement! The CMCP1100S accelerometer is manufactured in house to high quality standards. Each accelerometer is fully enclosed in a potted and waterproof stainless steel case. 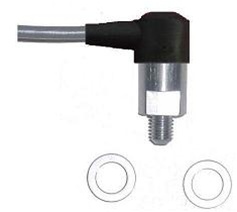 CMCP1100S accelerometers, in the three standard length cables, are always in stock ready for quick delivery. Other cable lengths are custom made to fit your exact specifications. Small Size Case, 1/2? x 1.05?